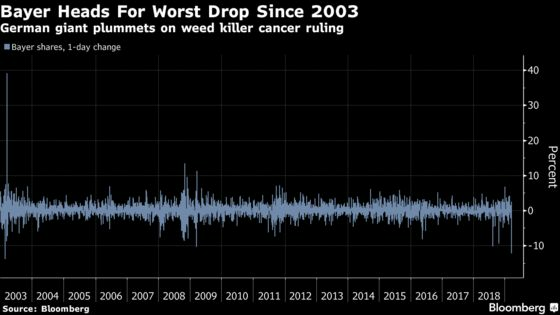 (Bloomberg) -- Bayer AG’s shares are on course for their worst decline since 2003, after the German pharmaceuticals and chemicals conglomerate lost the first phase of a jury trial concerning claims that its Roundup weed killer causes cancer. Cuts stock to neutral from buy as there’s “negligible chance of Bayer resolving/capping this issue in the near-term” and investors are likely to “stay away” until there is more clarity. Price target cut to 60 euros from 90 euros. News is a “major blow,” and the stock’s fall toward its 2018 low could increase the chance of it becoming a target for activists or a takeover. Overhang on Bayer shares “could be significant” as outcome was considered by some investors to be a potential bellwether for about 765 outstanding glyphosate cases. There was “budding enthusiasm” among investors for either a potential “surprise” verdict in favor of Bayer, or a hung jury, given multiple days elapsing during deliberations. Bayer could face settlements of over $5 billion (vs. 2018 Ebitda of 9.5 billion euros), adding to credit concerns and questions on 2022 deleveraging goals. Downgrades to reduce from add due to uncertainty over final settlements. Says company’s lowered valuation could trigger its break-up. Bank’s price target implies about 40 percent upside. Steady heads are required as more than 20 billion euros of litigation risk was already priced into the shares. Says more focus should be on an upcoming Hall versus Monsanto trial being held in St. Louis from April 1, which will better determine whether settlement estimates need to be refined.